I actively follow Broadway theatre just as much as I do West End theatre, but the only problem is that the sea between me and Broadway means I can't see any shows playing there (obviously). So when Beautiful - The Carole King Musical was announced and then started performances at the Stephen Sondheim Theatre in New York, I was more than envious of all of the people that got to see the show. I've grown up surrounded by some of Carole King's biggest tracks and to see a story featuring her fantastic catalogue of music set to her incredible story was fast becoming a dream of mine, so when the show was announced to have a London transfer, I made sure I was there as soon as opening night passed. I hate jukebox musicals, even the idea of them irritates me, but this show doesn't irritate me whatsoever. In fact, this show has me so blown off my feet that I'd go as far as to say that this show is one of the best Broadway imports I've seen in the West End for a very long time. Not only has Carole King's fantastic catalogue of music been updated and brought to life on the stage with such inspiration in tow, but the book to go with it (which charts King's career and rise to fame) is incredibly moving and makes this show feel much more classic musical theatre as opposed to how boring and drab the books most jukebox musicals are usually set to. The most moving moment in my memory is when King (*spoiler alert*) realises that her husband Gerry is leaving her at the end of the first act: when the song "One Fine Day" lends a verse to King, sung with such beauty and heartache, I couldn't help but cry. It was at this moment that I realised this show is more than a jukebox musical that only performs its songs when the characters actually do so in the book: this is a show that could mix this Chicago-style organised song structure with that of a normal musical. It really is utter perfection. Needless to say, the show is visually stunning. The simplicity of the set is totally irrelevant because the use of lights seem to carry each scene perfectly; the lighting is both glamorous and fun which only enhances how beautiful this show already is. The cast are also absolutely incredible: somewhat newcomer Katie Brayben absolutely shines as Carole King. Knowing the original Broadway cast so well, I was so worried that she wouldn't shape up to how incredibly well Jessie Mueller portrayed the role, especially considering Mueller won the Tony Award for Best Actress in a Musical for her performance... but boy was I wrong. Katie Brayben not only looks just like the uber successful recording artist, but she tackles the tunes so perfectly with such satisfying and gorgeous tone - her performance is honestly stellar and makes this show even better than what it already is. Performances by the rest of the cast are stunning too and especially by Ian McIntosh who plays Barry Mann for very similar reasons to why Katie is so charming (and McIntosh's incredibly strong vocal and stage presence is very appealing as well). If you're looking for a show to make you laugh and cry whilst also giving you a very strong and nostalgic message to hold onto both throughout the show and beyond then take a trip down to Beautiful - The Carole King Musical at the Aldwych Theatre. 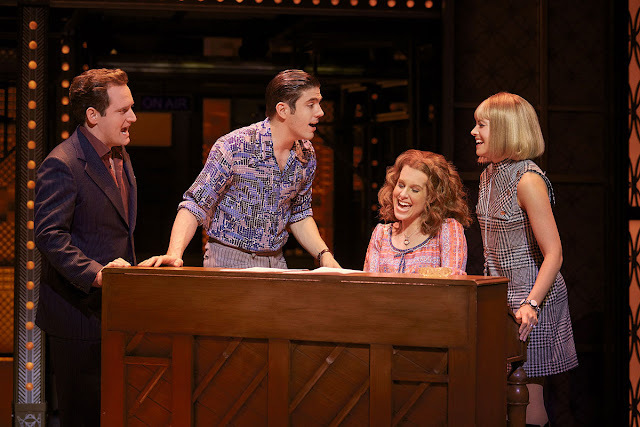 This is a show for both die-hard Carole King fans and newcomers alike and is the perfect example of what jukebox musicals should be: true to musical theatre.